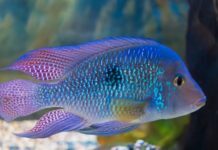 Also known as the Humphead Cichlid or Malawi Dolphin, this fish is popular due to its bright blue coloring and ability to share an aquarium with other African cichlids. 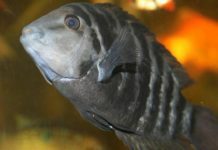 The Latin name for the Blue Dolphin Cichlid is Cyrtocara moorii. Its natural habitat is in the sandy areas of Lake Malawi in Africa. The coloring of the Blue Dolphin ranges from turquoise to a dark silvery-blue with six vertical stripes that are sometimes difficult to identify. The male is usually brighter blue than the female. The most distinctive feature of the Blue Dolphin Cichlid is the cranial bump on the forehead of the male species. It is a slow-growing fish but can exceed 12 inches at maturity. 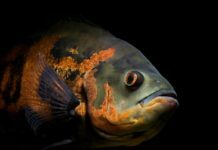 The minimum aquarium size should be 48 gallons but increased as the fish grows larger. 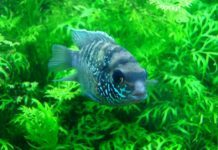 As with most African Cichlid aquariums, the tank needs to have rock caves in order to provide hiding places and spaces for the fish to mark its territory. Driftwood and sturdy plants may also be used. The Blue Dolphin is a bottom and middle swimmer in the aquarium so an open swimming space must be provided. The open areas of the aquarium should be decorated with coral sand and very small rockery. 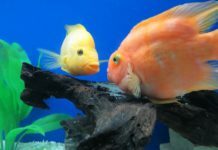 A good aquarium filtration system is required and water changes of 15% should be done weekly. PH Value should be 7.0 to 8.8. Water Hardness can range from 10 to 18 DH. Water Temperature should be between 72 and 84 degrees Fahrenheit. As with most African cichlids, the Blue Dolphin will take easily to any type of food. It can be fed flake foods, freeze dried foods, pellets, brine shrimp, water bugs and small crustaceans. As a supplement, it can be fed small pieces of hamburger and vegetables such as lettuce and zucchini. 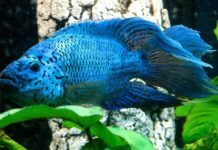 The Blue Dolphin Cichlid is a non-aggressive fish and can be kept with other small and non-aggressive African cichlids. In a large aquarium, the Blue Dolphin will form schools and it’s recommended to keep more females than males. By doing this, it causes less stress when the male wants to spawn. 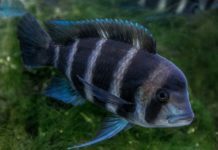 The Blue Dolphin Cichlid starts getting sexually active when its body size reaches three inches. The female will lay 20 to 50 eggs at one time on a flat surface such as a rock or log and wait for fertilization. 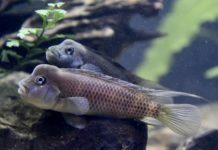 It is a mouth brooder fish so the female picks up the eggs and incubates them in her mouth for up to three to four weeks. The female will release the fry when she thinks it’s safe. Approximately one week after hatching, the female will no longer take the fry back into her mouth. At this point, the fry can be placed in a grow out tank. It is recommended to put the female in her own tank before she releases the fry. This will keep the fry safe because the female is too weak to fend off predators. The fry can be fed finely ground flake and live baby brine shrimp. The fry of the Blue Dolphin is very slow growing. To encourage growth, a daily water change of 15% can be done in the grow out tank. The Blue Dolphin is desirable because of its beautiful blue coloration and its peaceful nature. 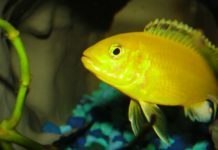 It can be kept with other passive African Cichlids in a community aquarium.